Birthplace : New Britain, Connecticut, U.S. The American advocate of world peace Elihu Burritt, called the Learned Blacksmith, conceived measures that helped internationalize the 19th-century pacifist movement. Elihu Burritt was born in New Britain, Conn., on Dec. 8, 1810. Though he possessed a good mind, he was forced by his father's death to leave school and apprentice himself to a blacksmith when he was 15 years old. He began so intensive a program of self-education, especially in languages, that his health suffered. Following some business experiences, Burritt settled in Worcester, Mass., as a blacksmith and there began a serious study of European and Oriental languages. He gained command of numerous tongues, including Hebrew, Chaldaic, and Syriac. Word of the abilities of the Learned Blacksmith reached the Massachusetts governor, himself a scholar, who referred to Burritt as exemplifying democratic values. Burritt, a shy and earnest young man, was offered a chance to study at Harvard but refused on the grounds that his place was with the common people. He developed into a successor of William Ladd, who saw peace as necessarily a world movement. In 1844 Burritt began one of a number of publications in behalf of peace, the Christian Citizen. The Oregon crisis between the United States and Great Britain inspired him to publish Advocate of Peace and Universal Brotherhood and to exchange "Friendly Addresses" with English pacifists. Invited by them to visit England in 1847, he there organized the League of Universal Brotherhood. His innovations as a propagandist, as expressed in Sparks from the Anvil (1847), aimed at influencing a broad public opinion. In the Oregon crisis, and also in 1852, when war was threatened between Great Britain and France, Burritt made personal visits and inspired civilian correspondence to encourage peace sentiment on both sides. He also sponsored "Olive Branch" advertisement in European newspapers which were widely reprinted. His next approach to the peace crusade entailed organizing conferences of eloquent and distinguished individuals from various nations. The Friends of Peace met in 1848 in Brussels. Successive congresses in Frankfurt, London, Manchester, and Edinburgh were widely approved and created a tradition of conferences and adjudications. Burritt returned to the United States to publicize his campaign for penny postage, intended to aid amicable correspondence. His plans lost momentum because of the outbreak of the Crimean War in 1854 and the impending Civil War at home. 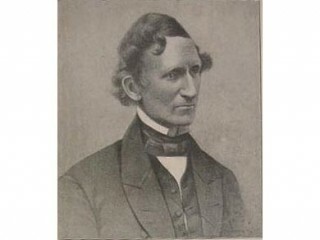 In his Citizen of the World, Burritt advocated an end to slavery through peaceful purchase of slaves by the government. The Compensated Emancipation Convention, held in Cleveland, Ohio, in August 1856, drew such notables as Gerrit Smith and Mark Hopkins but failed to affect events. Disheartened, Burritt turned to farming in New Britain. His publications increasingly summarized his experience, as in Thoughts of Things at Home and Abroad (1854), and he now turned his efforts toward reaching influential statesman and leaders of society, rather than the common man. In 1863 he made lengthy tours in Great Britain and memorialized these in publications such as A Walk from John O'Groats to Land's End (1864). In 1865-1870 he served as U.S. consular agent for Birmingham, England. Burritt returned home to New Britain in 1870. He continued to farm, teach, and write until his death on March 6, 1879. View the full website biography of Elihu Burritt.